Did you know that there's a widely recognized free and open source beer? 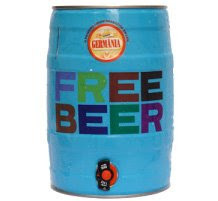 It is appropriately called "Free Beer" --the name is a play on Richard Stallman's common explanation that free software is "free as in speech, not free as in beer." 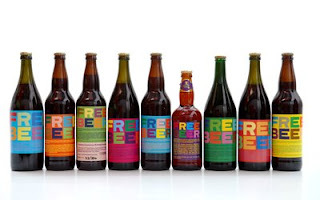 Free Beer was created by a group of students at IT University of Copenhagen together with Superflex, a Copenhagen-based artist collective to illustrate how concepts of the free software movement might be applied outside the digital world. The recipe and brand of their beer is published under a Creative Commons license, which means anyone can use it for fun or profit. "Stallman is annoyed that Superflex calls its project "open source beer": "You should have called it 'free software beer,'" he said prior to the Free Beer launch. But he no doubt recognizes the potential of this hack. As thousands are surprised by the quality of this fantastic beer yet puzzled by its name, at least some will read the explanation prominently printed on its large and striking label." Geeks surely know how to have fun. Cheers! Interesting post once again Jun. I didn't know that there exist such a beer. I wish I could taste some of it someday. By the way, I really dig your blog... a must read for GNU/Linux fans. My spouse and I tried a bottle of it last year. Assuming one likes beer, there's a good chance one would like free beer. "The recipe and brand of their beer is published under a Creative Commons license, which means anyone can use it for fun or profit." Just a note: Some CC licenses implement restrictions on who may make commercial use of the work. In this particular case, the Free Beer recipe is not licensed in such a way. However, it is important to note that CC doesn't necessarily mean you can use a work for profit.